5/5 this guy is like the energizer bunny... he is constantly moving forward with release after great release, I count at least three in the last few weeks. Here is yet another reason that Bear gets gigs... he just rocks it out. 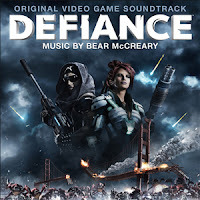 This month brings us the long-awaited rollout of the groundbreaking multimedia science fiction epic “Defiance.” Developed from the beginning as both a SyFy television series and an immersive videogame from Trion Worlds, “Defiance” marks the first attempt to debut a franchise of this scale in two unique formats. The game and the series take place in a future Earth, terraformed by invading alien races known as the Votan. Themes of exploration, racial tension and frontier life have been transplanted from the western genre and fit perfectly in this strange new vision of our world. The game and series share principal characters, visual effects, production design and story arcs. They also have one other important characteristic in common: the original score. I love LOVE Bear. I got to know his work on BSG. And he does Walking Dead too. What a master of music.